The decline in bee populations has been all the buzz lately, which led Whole Foods Market to team up with the Xerces Society to show us what a world—or at least, produce section—without bees would look like. The University Heights, Rhode Island store removed all foods that are reliant upon the important pollinators, and it leaves a pretty slim selection; 52% of the produce department’s offerings would be pulled from shelves without bees around to help. Busy bees help pollinate countless essential plants that make their way into our daily diets. To show just how important they are, Whole Foods removed quite the shopping list from their produce section: apples, onions, avocados, carrots, mangoes, lemons, limes, honeydew, cantaloupe, zucchini, summer squash, eggplant, cucumbers, celery, green onions, cauliflower, leeks, bok choy, kale, broccoli, broccoli rabe and mustard greens from their shelves. 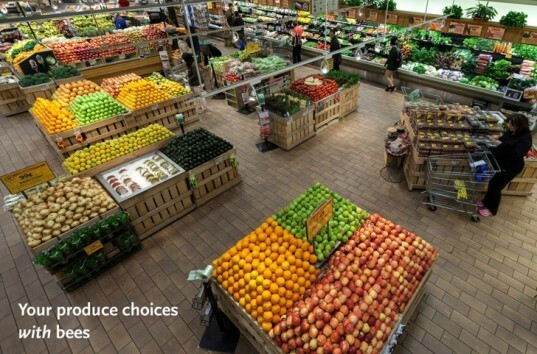 Although the store only yanked the fruits and veggies from the shelf temporarily, the scene could be a glimpse into the future, with the harsh reality of dwindling bee populations. Whole Foods is trying to help raise awareness of the importance of the bees, and will be donating 10 cents for every pound of organic summer squash sold from June 12-25. They’ve also implemented a program called Share the Buzz, giving shoppers insight on foods that help foster bees, as well as non-toxic pest tips. RuffBurr, pesticides do far more damage to the environment than GM crops do. It's great that they're doing this. Too bad almost everyone else doesn't know/care. The decline in bee populations has been all the buzz lately, which led Whole Foods Market to team up with the Xerces Society to show us what a world—or at least, produce section—without bees would look like. 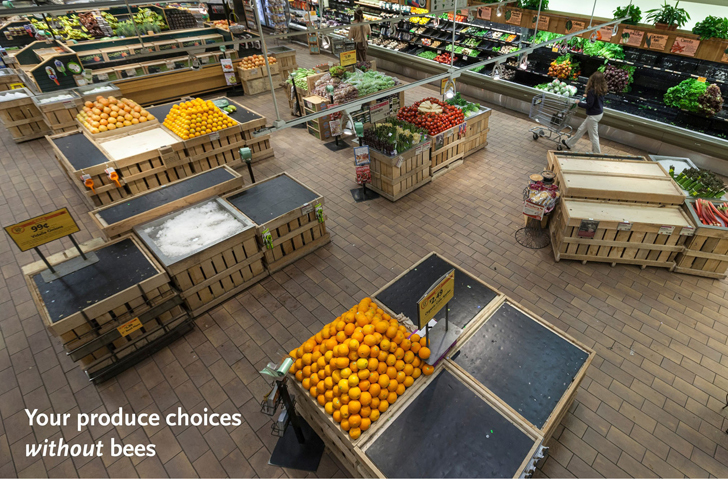 The University Heights, Rhode Island store removed all foods that are reliant upon the important pollinators, and it leaves a pretty slim selection; 52% of the produce department's offerings would be pulled from shelves without bees around to help.